I’m not entirely sure how best to frame this news; whether it’s an exciting new chapter for our film festival, a sad moment where I admit my hometown doesn’t want the same things as me, or a middle finger to the plentiful number of people who have done their best to wedge a stick in my spokes ever since I launched the NRFF project. Maybe it’s all three of those things. The Norwich Radical Film Festival will not be returning to Norwich in 2018. Instead, our weekend of independent, revolutionary cinema will be taking place in Amsterdam. Everything else remains the same. Same films, same purpose, with improved resources, support, and local enthusiasm. When I first began the long process of organising the Norwich Radical Film Festival, I did so with a spring in my step it is hard to imagine now. Casting my mind back to the very beginning, in Spring 2015, I must have been one of the few self-professed radicals with very much of anything to look forward to, following the galling Conservative election victory of the year’s election. But I was determined to do something to engage a new generation with earth-shaking ideas through culture – and better still, entertainment – by showing films, championing new causes and filmmakers. And we did. We brought films you couldn’t see anywhere else, let alone Norfolk, to my own back yard. Of course, the ‘We’ was the essential element to pulling that off. I spent the majority of the year of preparation building a team of all the talents, for a weekend of festivities. I am in their debt, in both the literal and figurative sense. The ‘We’ also came to include the vast majority of those attending the festival too – which was really the entire point of hosting a festival, with filmmakers and activists present, to engage a wider section of Norwich and Norfolk society with radical ideas. The event would literally have been nothing without those people open-minded enough to have given our first year celebrations their time. “Unfortunately”, as is the catch-phrase of the half-arsed bureaucrat pushing pencils in every venue in Norwich, the festival did come at a price. As I’ve mentioned on the page previously, the NRFF was almost entirely self-funded. Family and friends gave what they could, while I worked occasional shifts in a student bar, coupled with night shifts at a mental health care facility in order to scrape together some extra funds. Even so, it was an event I have just barely this month finished paying off – and only then thanks to loved ones literally writing off money I owe them as non-performing debt. This was because, in spite of the thin-spread team of dedicated NRFF volunteers, and in spite of the fantastic array of people who attended the films, the festival was viewed dimly by a number of people who we had hoped to rely upon to deliver it in the future. Most notably, these people included most of the venues of the city – who viewed the NRFF not as an investment that could bring audiences to their otherwise empty venues screening the latest failed DC Universe movie, but as little more than a hired function, who should stump up substantial money upfront for the privilege of playing between their hallowed walls. Meanwhile, as we struggled to deal with the closed shop mentality of local businesses, we were also met with a wall of hostility from a number of local experts. Mediocre fish in myopic ponds emerged throughout the festival’s cycle, dragging their limbs from the mud of Norwich’s depleted talent pool to declare they were outraged at films we had the temerity to show. Rather than simply attempting to contribute to discussions in person, though, these individuals, who often silently attended screenings without offering protest, preferring to snipe online about the perceived shortcomings of anti-war films as if we had just shown a pro-seal-clubbing polemic. Worst of all, however, is that people seem content to live like this. While, again, our event did have a great turn out, and was attended by some fantastic people, the bulk of people who I might have once thought would have an interest in this project; members of the art community, and local political radicals, remained ambivalent at best and contemptuous at worst. I can’t really explain exactly why so many people seem happy with this state of affairs, except that despite taking pride in being the ‘Remain’ haven of Norfolk, Norwich is ultimately plagued by the same disease as the rest of Brexit Britain. Some people are happy a bunch of crooks are in charge of our four venues, because at least they’re distinctive, local crooks. They’re glad that nobody with new ideas ever troubles to come up the A47, because it makes their banal, trivial musings seem important and intellectually weighty. When Steve Coogan locates a comedy caricature of a television personality to a radio station in Norwich, to show how small-minded and delusional he is, the City rejoices in its paradoxical relevance. Well, it’s all water under the proverbial bridge now anyway. I moved to Amsterdam in January 2017, as did our Director of Programming, Alexandra Nakelski. While at first we discussed returning to Norwich to revive the festival for one final outing in the ‘Fine City’, it was also suggested we try putting on a showcase in the Netherlands. I’m not proud to say I was resistant to this idea at first; but looking at it now, it’s the best idea I’ve heard in a long time. Since then, the festival has partnered with two venues – which have cinema screens, seats and a bar – for free. That’s €0 (which, even with the Pound’s state of decline, still translates as £0). I can tell you now, for a venue of the same size and prestige in Norwich, we paid £500 a day (not including VAT). And why is it free here? Because there are more venues, so each needs to look to events to give punters something different to bother attending, instead of the latest box-office fodder? 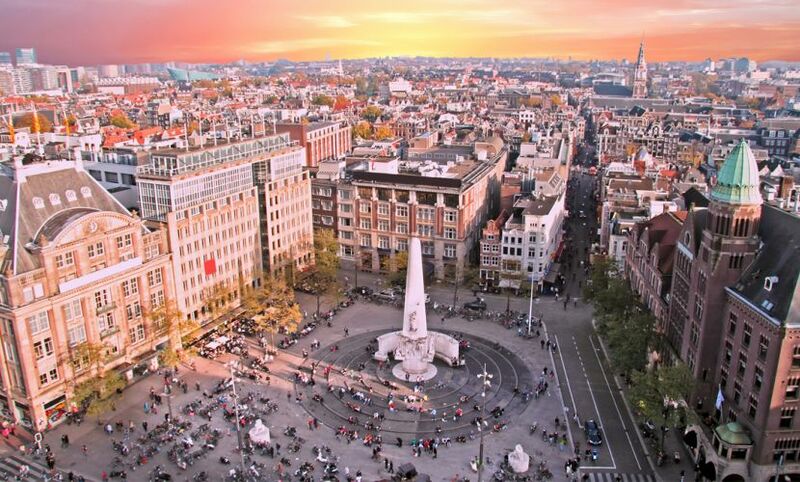 Because Amsterdam inherently values the arts – including film? Because they like our logo? Either, both, who knows, but from where I’m standing, it doesn’t really matter. Likewise, we have found a university here which is ultimately a different species all together, similar in virtually no way to the bureaucracy-bound UEA. While I appreciate that individuals at Norwich’s university had their hands bound in how closely they could support us, every mention of a project here has been met with a level of enthusiasm I had grown to think was simply unnatural. That was emblematic of my time in my home city, certainly, as well as a number of ‘outsiders’ who felt numbed by the experience. As a result, instead I learned to approach the project with dread. It was something that ultimately made me behave in a less than supportive manner myself on a number of occasions, something which, with hindsight, I am not at all proud of. Now we have seen a level of support which has me convinced that, actually, the natural state for people regarding artistic projects should be one of anticipation and happiness. Please understand then, that particularly for me, going ‘back’ is no longer possible. I know all of this may have been hard to hear for a few people – and above all else I’m keen to point out that this is not me taking a swipe at our audience, our volunteers, or anyone who helped us in 2016. Please, if you can make it to the Netherlands this year, any one of you is more than welcome to come join us for round two. Norwich, frankly, was not good to me. It wasn’t good to my friends, my family, and it certainly wasn’t good to our dreams. It’s time for a change of scenery – that’s all there is to it.